Usually I expect the best when it comes to games developed by NetEnt software platform. Unfortunately, the poor-quality game graphics don’t measure up to the standards of other NetEnt games. That being said, play Super Lucky Frog Slot Machine and you could win one of three jackpots. That’s enough for anyone to play, regardless of the graphic quality. The Super Lucky Frog Slot Machine contains 5-reels, 25-paylines, and a whopping 3 jackpots! The reels contain images from a magical garden grove with griffins, butterflies, fairies, and, of course, a frog. 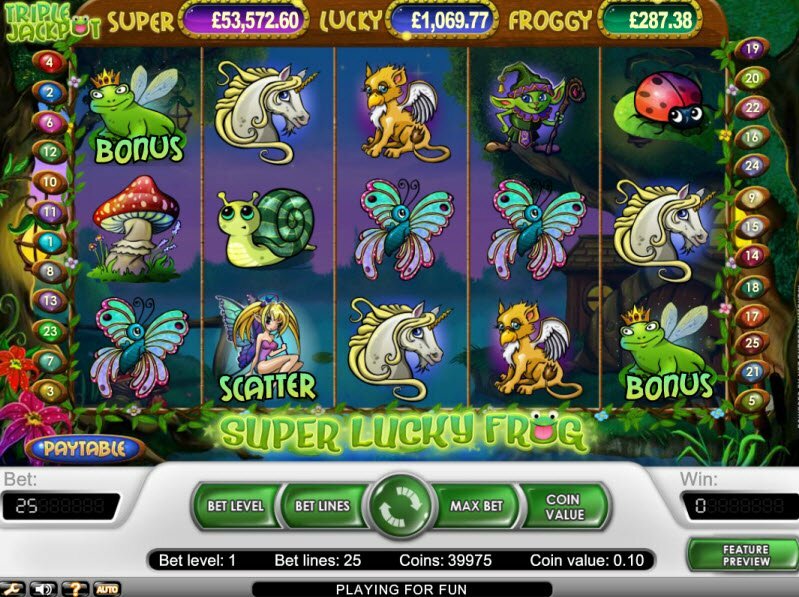 Take a spin of the Super Lucky Frog Slot Machine and you could win lots of money just for playing online. 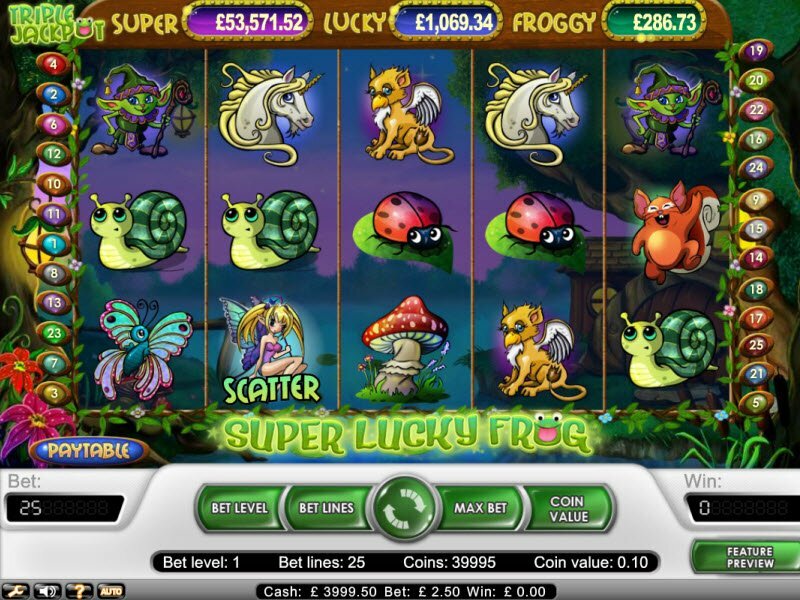 The Super Lucky Frog Slot Machine contains lots of mythical creatures and critters including fairies, griffins, ladybugs, mushrooms, snails, butterflies, squirrels, unicorns, elves, and, of course, a little frog prince. The graphics are really simplistic and look more like hand-drawn pictures rather than computer animated images. Even so, the game still retains some appeal with its quirky sound effects and colorful characters. There’s a lot about Super Lucky Frog Slot Machine that is lacking. However, what it doesn’t lack is jackpots! Not One, Not Two… But Three Super Lucky Frog Jackpots! There’s a lot about Super Lucky Frog Slot Machine that is lacking. However, what it doesn’t lack is jackpots! The best part of Super Lucky Frog is that it features three different jackpots! The frog serves as the Bonus Symbol, which triggers the jackpot game if three appear on the reels. The Super Lucky Frog Slot Machine also has a few special symbols on the reels. 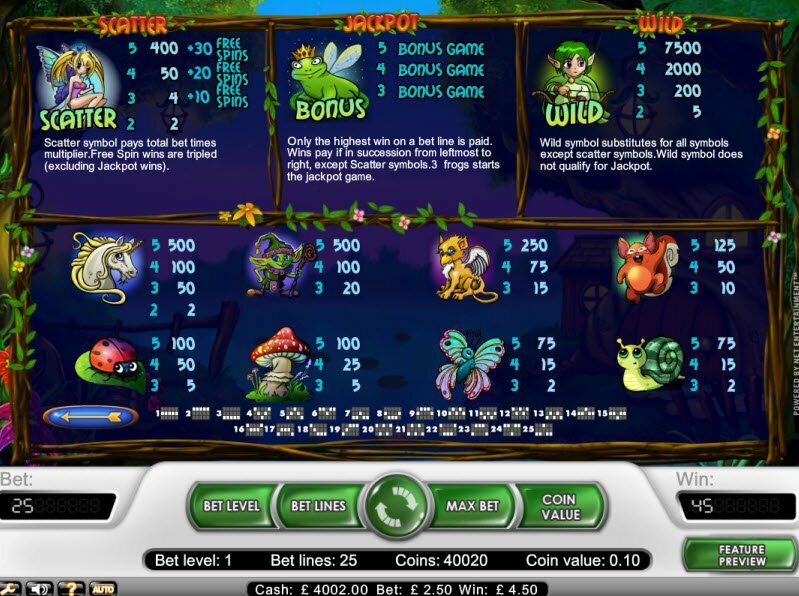 The girl fairy represents the Scatter Symbol, which pays the total bet times the multiplier. The boy fairy represents the Wild Symbol which substitutes for all symbols except the Scatter.